THE GOVERNMENT is considering setting up a huge comprehensive database to store recordings of every electronic communication – every phone call and email – in Britain, as part of the “war on terror”. Such a move would require the compliance of telephone companies and internet service providers, who would be required to pass all their records to the Government-run database. The Home Office plans so far are at an early stage but could be included in the draft Communications Bill to be included in the next Queen’s Speech in November; Government ministers have yet to see the draft plans. About 57 billion text messages were sent in Britain last year, while an estimated three billion emails are sent every day. Civil liberties and data protection groups have already expressed alarm and expressed objections to the increasing “Big Brother” state. But the Home Office is claiming that keeping these electronic information records is essential to protect national security but claims the information will be subject to rigorous safeguards. This will raise many hollow laughs considering the number of occasions in the last few months when confidential Government records containing important personal information about hundreds of thousands of have been lost. These losses have largely been attributable to huge swathes of job cuts in the civil service leaving those surviving overstretched and the privatising of many civil service functions, including confidential data transport. This begs the question as to how, with insufficient civil servants to carry out existing commitments, the Government expects to assemble and protect such a large database. And sadly the obvious answer is that they will get the private sector to do it. The Government already has an appalling record of disastrous contracts with various private sector giant information technology companies. The high-level civil servants who negotiate the contracts have little understanding of how their own departments operate at grass roots level and are not competent to instruct the companies’ software creators in what is needed. The resulting errors have been catastrophically expensive to taxpayers – not to mention those citizens whose personal details are lost or recorded erroneously. But the IT companies have made a fortune from creating the faulty systems and then putting them right. 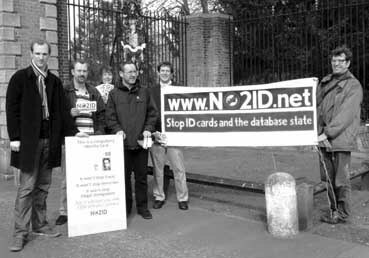 Already civil liberties groups and campaigners are concerned at the database the Government intends to create to back up the proposed biometric identity card scheme that will records many personal details about each one of us, including our credit card spending records. Another giant database is even now being created with all our personal health details. Electronic travel cards like Oyster and the pensioner Freedom Pass already record our every journey by public transport and hundreds of thousands of surveillance cameras watch our every move. How can so much information on so many people possible be used? Could there ever be enough human snoopers in either the public or private sector to have the time to sit through it all and make sense of any of it? Unfortunately if they want to focus on any individual or small group it will be easy for them to do so. But the comings and goings, lives and deaths of the vast majority who do not come to the attention of those in authority will pass as anonymously as they do now. For this reason alone, the huge databases will have little effect on preventing any kind of terrorism so long as the perpetrators have never drawn attention to themselves. The system will only notice them after the event. Real terrorists and big time criminals will already be well aware that there is no such thing as a truly private phone call, letter or email. They will be careful not to use the trigger words that can be found by electronic searches and draw attention to potential suspects – such words as “bomb”, “detonation device” and so on. But thousands of rebellious teenagers will deliberately use these words all the time just to create chaos in the system. We have to ask ourselves who will actually benefit from these expensive and sinister databases? Access to these will of course be the dream of every marketing manager who wants to target their advertising at their most likely customers. And if these databases are being run by the private sector it is a fair bet that the profit motive will overcome any scruples about data protection. The IT companies will probably justify selling information to marketing agencies on the grounds that it will save the taxpayers a few pounds – local authorities already do this with electoral registers and have done for years. If passed, this will mean that the monitoring of people in Britain is far in excess of what is happening anywhere else in the world, including the United States and Europe. But there is no doubt that western imperialist governments will be watching closely with an eye to introducing these measures to control their own working classes. The Home Office is claiming the measure is part of plans to implement an EU directive developed after the 7th July bombings to bring uniformity of record-keeping – though it seems Westminster is volunteering to pioneer the scheme. We can only say that if the bourgeois state feels the need for this level of control and monitoring, it is expecting the class struggle to become a lot more energetic in the near future. And this expectation is probably based on the growing economic storm that could, if the organised workers of the world get their strategy right, bring an end to the dangerous and destructive system of global capitalism. Meanwhile the Joint Select Committee on Human Rights last week attacked Prime Minister Gordon Brown’s plans to extend the time that a terror suspect can be held from 28 days to 42 days. The cross-party committee, which includes MPs and peers, said this extension was “wholly unnecessary” and proposed a series of reforms which it says are a viable alternative to increasing the current 28-day limit. MPs are expected to vote on reforms to the Counter Terrorism Bill next month and opposition to Brown’s proposals is growing steadily, leaving Brown facing the prospect of defeat on the same issue that saw Tony Blair suffer his first Commons defeat. The JCHR said “no clear evidence” has emerged of any likely need to extend the pre-charge detention period. And it describes the proposed safeguard against wrongful detention – a parliamentary vote after the 42-day power has been triggered – as “virtually meaningless”. He said the alternative package would better protect the public and comply with human rights principles, “whilst also reducing the risk of alienating minority communities”. THE INCREASE in the numbers of young people being shot or stabbed to death by other young people is dominating newspaper headlines and was a major issue in the recent London Mayoral elections. The immediate proposals from the new Mayor, Boris Johnson, are for more powers for police to stop and search young people and for metal detector scanners at strategic points such as rail and Tube stations. Various right-wing tabloids are screaming for longer sentences for those found carrying lethal weapons. These methods only scratch the surface of the problem because they do not deal with the root cause of why young people carry weapons and band together into gangs. Confiscating knives or holding amnesties are useless because knives are so very easily replaceable and always will be as long as people need something to cut up their food. The Independent recently published the results of a survey that asked youngsters why they carry knives. The response was almost unanimous – for protection. Almost all those questioned cited some event that they or a close family member or friend had experienced where they had been attacked and afterwards decided to carry a knife for protection. As for joining gangs, human beings are social animals, they will always form groups of friends who go about together and adolescence is the major stage in life for developing independent social skills and forming long-lasting friendships. And it only takes one or two seriously anti-social groups for all the rest to be convinced they need knives for protection and suddenly the town is full of dangerous rival gangs. Many gangs entrust their youngest members to carry weapons because they know, if caught, the underage youths will incur much lighter sentences from the law. Once the weapons are in the hands of children, who may have been “taught right from wrong” but are still not old enough to understand just how wrong it is to kill another human being, casualties become inevitable. What is lacking in these young people’s lives is adult attention, interest and intervention. It is no good blaming parents or teachers. The parents love their children deeply but are busy and exhausted earning a living, working long hours, juggling rising debts, housing costs and all the stresses that modern low-paid workers are subject to. The teachers are also stressed and under enormous pressure to improve their school standing in league tables. They and their pupils face endless testing and judgement – enough to alienate many, leaving them jaded and cynical. They have no time for teaching the humanities, music or the arts – which are not tested. Nor do they have time or attention enough for pupils who are struggling – they must prioritise those who will do well in exams are raise the standing of the school. Local government cuts over nearly three decades have wiped out most youths clubs, hobby activities and other constructive activities for young people. So thousands of youngsters are left entirely to their own devices, to support each other socially, emotionally and morally. And a few discover that associating with adult criminals and drug dealers can bring them instant wealth and material goods that their low-paid wage slave parents could never provide. The children who get involved in illegal, anti-social gang activity are the victims of social neglect. But a capitalist society that promotes individualism, greed and selfishness can have no answers. Wherever these children look to the higher levels of society they see greed, corruption and crime and capitalism teaches them this is the only way forward. Most capitalists bend or break the rules a bit – it improves profits and increases the chances of survival in business. Criminal gang bosses simply take this a bit further and ignore the rules. We have only to look at the vast contrast with the status of children in socialist societies, where they are cherished, encouraged and respected, to see there is a far better, happier way to raise children.